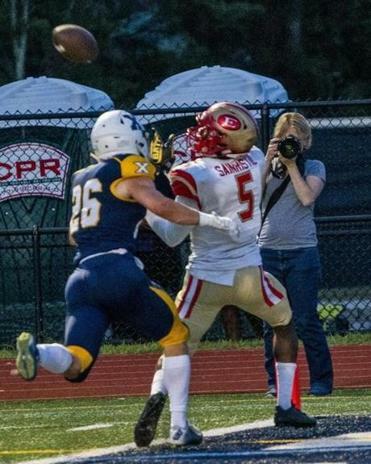 Everett’s Mike Sainristil (5) watches the ball head for him over the coverage of Xaverian&apos;s Cooper Deveau (26) in Westwood Friday night. Khari Johnson, Catholic Memorial — In a resounding 49-25 victory for the Knights over defending D3 state champion St. John’s of Shrewsbury, the senior caught five balls for 94 yards and two touchdowns, adding a third score on a 90-yard kickoff return. Mike Sainristil, Everett — The Crimson Tide’s triple threat picked up where he left off, securing eight catches for 102 yards and two touchdowns in the season opener. Sainristil also ran for 15 and 16 yards on two fake punts to keep Everett rolling. AJ Caggianelli, Central Catholic — The senior rushed for touchdowns of 55 and 4 yards and added a 25-yard fumble return for a touchdown to pace the Raiders in a 48-6 win over Dartmouth. Gabe DeSouza, North Andover — In his first official game for the Scarlet Knights since a cardiac scare in last year’s D2 North title game, the senior receiver was a focal point in a 35-7 victory over Woburn in Week 1 with four catches for 123 yards, three touchdowns and an interception on defense. Billy Silvia, Braintree — Last year’s second leading scorer in Division 2 picked up right where he left off last season for the Wamps, rushing for 106 yards and three touchdowns while also collecting an interception in a 28-13 victory over Quincy. James Dillon, Lincoln-Sudbury — After helping his team reach the D2 state finals, the 6-1, 210-pound senior running back proved the Warriors are poised to get back to Gillette after he rushed for 135 yards and a career-high five TDs in a 35-7 rout of Springfield Central. Brendan McHugh, North Attleborough — The senior running back ran for 92 yards and scored both of the Red Rocketeers’ touchdowns, including a 33-yard scamper up the sideline with 1:33 left in the fourth quarter for the winning TD to hand King Philip its first loss in three years. Nolan Houlihan, Billerica — In his first career start, the junior QB threw for 320 yards and six touchdowns as Billerica survived a wild 54-49 shootout against Lowell. Matt McCarthy, Danvers — The senior jack-of-all trades finished his night with 233 all-purpose yards and scored on a 93-yard kickoff return and rushed for another TD in the season-opening win for Danvers. Luke D’Aloia, Hopkinton — The senior wide receiver/defensive back caught seven passes for 128 yards and 2 TDs in the Hillers’ 20-0 season-opening win over Wayland. He also recorded a crucial strip sack of Wayland QB Wellington Pereira in Hopkinton territory. Kevin Peete, Melrose — The senior running back picked up right where Isaac Seide left off, rushing for TDs of 6, 52, and 77 yards in a 40-6 drubbing of Malden. Jake Doherty, Burlington — The senior running back rushed for 398 yards and four touchdowns and scored on a 95-yard kickoff return in the Red Devils’ 43-33 win over Bedford. Mange Camara, Watertown — The senior scored on an 86-yard kickoff return, a 74-yard run, and a 39-yard pass reception and was 3-for-4 on extra points. On defense, Camara forced one fumble and recovered another for a 40-yard return. Matt Arvanitis & Anthony Dzindolet, Holliston — Arvanitis (8 of 17, 203 yards passing) connected three times with Dzindolet (138 yards receiving) on TD passes of of 85, 35 and 17 yards in a 33-15 victory over Norton. Aidan Sullivan, Scituate — Sullivan overcame a slow start to complete 15 of 23 passes for 215 yards and two touchdowns, adding a rushing score as well, in Scituate’s 34-14 win over Norwell. Ben Yanakakis, Ipswich — The senior quarterback did a little of everything in his team’s wild 44-38 win over Essex Tech, throwing for 117 yards and a pair of TDs on 8-for-10 passing while rushing for a pair of TDs and converting all four of his team’s two-point attempts. John McCormick, Martha’s Vineyard — The senior running back burst onto the scene in Week 1, rushing for 127 yards and 3 TDs on eight carries while also recording three tackles on defense in Martha’s Vineyard’s 55-0 win. Will Garcia, Old Rochester — The 5-foot-8-inch, 165-pound senior running back turned eight carries into 154 yards and 4 TDs of 51, 1, 14 and 2 yards in a dominant 35-0 first half of a 42-0 blowout victory. Spencer Rose, Bourne — The senior scored a pair of TDs on a 40-yard pass reception from James Cahoon and a 60-yard punt return in a 19-6 South Coast League win over Upper Cape. Carmine Palmisano, Georgetown — A former guard converted to running back, the 6-1, 180-pound senior plowed his way to 178 rushing yards and a pair of TDs on 16 carries to key a 20-point comeback win against TechBoston. Ian Miller, Mashpee — The junior QB was solid in his first varsity start as he threw TD passes of 15 and 7 yards and rushed for a 1-yard TD while connecting on three passes for two-point conversions. Jackson Murray, Coyle & Cassidy — The junior QB rushed for a game-high 163 yards on 21 carries and scored on 3 TD runs to lead the Warriors to a 28-0 win over Carver. Kenneth Rezendes, Matignon/St. Joseph Prep — The senior captain was an ironman for the Warriors in their 6-0 win over Minuteman, rushing for 85 yards and the game-winning TD with 3:31 left in the game while also totaling 10 tackles on defense. Takari Hobbs, Boston English/New Mission — The standout running back from New Mission ran for 159 yards and a pair of TDs, scoring on a 7-yard run to tie the game with 10 seconds left. The Eagles scored on the ensuing two-point conversion to pull out a 36-34 win. Nate Weitzer, Karl Capen, Jake Levin, Brandon Chase, Lenny Rowe, and Steve Sousa also contributed to this report.